This is the first in what will be an ongoing series revolving around the things we find which are broken or can be broken. With 7 years of "organized" game play, we have some experience with this. 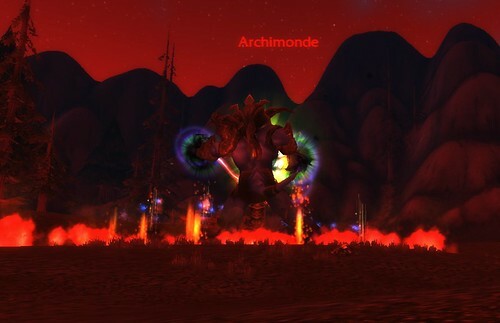 Our first bug comes from the Burning Crusades raid The Battle for Mount Hyjal. If you aren't familiar with the raid, you access it in the Caverns of Time. If you take the dragons to the bottom, when you land, it's to your right. There's a "park", sort of. You run through the sand to a portal. That portal takes you to the first room of the raid. This is where the tier 6 vendor and original Burning Crusades jewelcrafting pattern vendor are located. 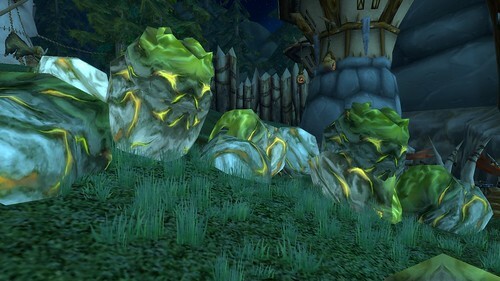 Tier 6 tokens are obtained from Hyjal, Black Temple and Sunwell. It used to be, you had to get a couple people to form a raid with you so you could get into this room; so annoying. Thankfully, that's not the case anymore. We've been running Hyjal in an attempt to get my warlock her T6 gloves to complete the Malefic set. I really like the looks of it. There are a lot of people who feel gear set design was at its zenith with Burning Crusades. We'll explore gear sets in an future post. Anyway, I've been trying to get the gloves to complete the set. Some guild members came along to make the process of clearing the raid faster. At level 82, I would have a bit of difficulty but it wouldn't be insurmountable. Still, having people willing to come along on a legacy raid makes things go quicker...until they don't. The raid is divided into 3 parts. You start with the Alliance portion. Two mini-bosses spawn after waves of demons. Once crushed, you move on to the horde area. This is where the bug shows up. We killed the first waves and the first mini-boss, a big cow-looking thing with a really cool sword, is supposed to show up. He never did. There is a set time between waves of demons and that time passed with nothing coming. We ran around and discovered demons had spawned in the Alliance side, which they aren't supposed to do. Then, wave 6 of the first 8 in the horde side spawned again. That's where rock elementals arrive. We endured this for a good half hour before deciding we'd broken the encounter. Turns out, this is a known bug. Here's what you do. Generally speaking, if you run out, hit "reset" and wait 30 minutes, the encounter does a hard reset and you'll pick up where you left off. We discovered that didn't work in this case. We actually logged for the night and came back the next day, only to have the encounter freeze at the same place. Don't kill the waves too fast. The mobs don't have much health and are easily one-shotted. You might have to remove gear so it takes you longer to kill them. There are frost dragons who show up. Let them land on the ground and then kill them. And, you can let Thrall die or take off all your gear and have the mobs kill you. Either case considers the event a wipe and can reset the counter. Unfortunately, for us, none of these methods reset the raid. We weren't able to get the mini-bosses to spawn. At that point, you have no choice but to leave and come back after the Tuesday reset. It's hugely frustrating to the casual player because you just want to finish what you start. Still, if you've ever done the raid and not had time to wander around, having the encounter bug out on you gives you plenty of time to see things. Go to the demon area over by the Alliance zone. Creepy.